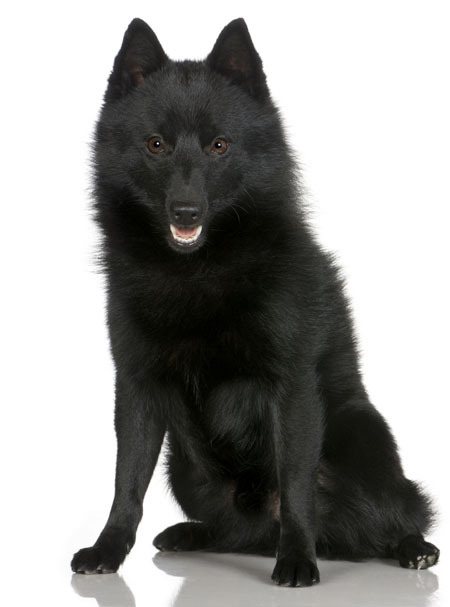 Learn about the temperament and personality of the Schipperke. Discover what he's like to live with, his traits and characteristics and how he generally behaves. And look at lots of Schipperke photos. The Schipperke is alert, active, inquisitive, intelligent and hopelessly devoted to his master. They are a beloved playmate and a natural watchdog with a piercing bark. (They can be a touch yappy.) Schips seem to know that they are smart and cute, and if you let them, they will take over your household. These are extremely active dogs. They are confident and independent, and can be a bit willful. The Schipperke has excels at seemingly everything the dog world has to offer: obedience, agility, flyball, rally, heelwork to music, herding, tracking -- they've even been known to enjoy a game of patty cake. This is the breed that can do it all. Unless you ask him to sit around and do nothing. This he cannot handle and will begin strewing your trash and dirty laundry all over the house. Schips are rather famous for being devoted to children and are very protective of them. This doesn't always hold true though when dealing with an adult Schip who hasn't been around children much. This can be a dominant breed. The Schip has a good nose on him and if he finds a scent that interests him, he will follow it, regardless of where you want him to go. They have a tendency to explore once they've escaped. They like to be on the go and do best with a family who feels the same. Schips make excellent hiking, camping, and traveling companions. They do well with other dogs, as well as cats, horses and cows. They don't like to be left home without you, as they feel they have a right to be involved in whatever you are doing. They want to be where the action is. And beware if the action is in your flowerbed, as these are skilled diggers. They also don't seem to be in any hurry to housetrain. These are enthusiastic, joyful, highly energetic dogs who are fearless and devoted. They are vigilant and consider it their job to protect their family and property. The Schipperke is very intelligent and easy to train. He learns new commands very fast. The Schipperke is a very heavy shedder. He sheds an awful lot of hair! You'll find hair all over your home, stuck to everything! You'll probably even find it in the butter!